For months and months, I've been dying to see The Golden Compass. Yesterday, I finally caught a matinee. What did I think? Well, as they say here in New York . . . meh. There were certainly things I liked about the movie--the bear fights, the young actress who played Lyra Belacqua, and Daniel Craig. But I found myself checking my watch after the first thirty minutes. 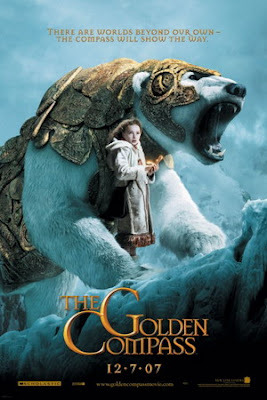 It was a decent Hollywood film (and the Ice Bears were amazing), but it just wasn't as weird and wonderful as Philip Pullman's books. I guess I'd give it a solid B. Have any of you seen it? Yeah, I've seen it. I thought it was really good, but it was pretty different from the book (the book goes farther). The ice bears were so real looking! I can't wait to see it...I saw a clip of the ice bears and it looked like good stuff. Wish I had time to read the book. I LOVED (I mean REALLY LOVED) the book, but I have not yet seen the movie. I can't wait to see it. The bears look amazing, and the actress of Lyra does look fitting. I can't wait to see the witches! When I was in Paris, there were adds for it all over the metro stations. All of them looked pretty cool. I really want to see it, but it will probably be dubbed in Slovakia. IM: The witches are pretty cool, too, but you don't see much of them. Anonymous: Are you still in Paris? You know a lot of the movies there aren't dubbed. You just have to look for the letters "VO." That means it's the original version with French subtitles. A real life-saver for English speaking people in France! Really? I never new that about movies. In Slovakia, most of the children's movies are dubbed for the little kids who can't read yet. Besides, I never have time to see them because movies are usually only in theatres for a day or too. Even Harry Potter movies are only in for a few days. I had to wait till I could come back to the states to see the 5th one, after it had already been in theatres for 3-4 weeks. Oh yeah... I forgot to answer your question about Paris. No, I am not their still (though I wish I were!). I am safe home in Kosice. I lived in Paris for a little while. (But my French is HORRIBLE, so I always saw the VO movies.) Are you originally from Slovakia? If not, how did you end up there? I've heard about the controversy. I think the world would be a better place if people who hold different beliefs decided to share them with each other a little more often. But having said that, there's very little in the movie that would offend anyone--except maybe bears. I'm American. My dad got transfered here for three years. I brought Kiki Strike and I really want the Empress's Tomb for Christmas when I fly back to The States. Philip Pullman is quoted in a newspaper as saying, "I'm trying to undermine the basis of Christian belief." The bad guys are called the Magesterium, which in real life is the teaching body of the Catholic Church, the Pope, the Bishops, and so on. Obviously he's trying to make the Church look evil. According to the Catholic League, he is "using a fantasy to sell atheism to kids." I believe the anti-Catholicism is toned down in the movie, so if you don't know it's there, you might miss it. I believe Pullman hopes that people will think, 'Oh, what a sweet movie! I love the cute little bears!' and buy their kids the book for Christmas, and then maybe they'll lose their faith. I hope I don't sound like I'm mad at anybody here, because I'm not. Hazel: No problem! ALWAYS feel free to speak your mind. You could write a whole book here if you wanted to. I think it's great when people are passionate about subjects--even if I don't always agree with them 100%. I must admit that I've never come across any statements like that from Philip Pullman. (I'll also admit that I haven't been looking very hard.) If that quote is right, I can totally understand why you're miffed--and why you'd boycott the movie. But selling atheism to kids--here's my thought. And as always FEEL FREE TO ARGUE. The books (as well as the movie) are waaaaay too complicated for little kids to understand. (In fact, I think they're way too complicated for most adults to understand.) Older kids? I'm not sure they're all that easy to sway. I mean, look at you guys! I think most young people are too savvy to be brainwashed by something as simple as a book or a movie. In this country, people have the right to speak their minds. But other people have the right to argue--or refuse to buy their darn movie tickets! So we're all doing the right thing here. The most important part is having a good discussion! Oh yeah, that quote was in the Catholic Standard, I think last week's edition. And I think he made a weak false god character, to represent Christ, who gets killed in the end. Who wants 2 c National Treasure 2? I do! COmes out tomorrow! YAYYYYYYYYYYYYY!!!!!!!!!!! Everybody... I FINALLY saw it! I liked it, despite the two stars it was given by The Blade (the Toledo paper) reviewer. Though one little (big) thing I noticed was wrong. The one person was supposed to die! I won't say who. It seems cool but my mom says it's "anti-Catholic", so I can't see it. *sigh* I think it's so stupid that all these people are protesting it. Get a life, please. Movies made out of books can never, and I repet Never be as good as the book.